The Ann Arbor VA Urology Program is product of a tertiary care facility working in close partnership with the U-M Department of Urology. 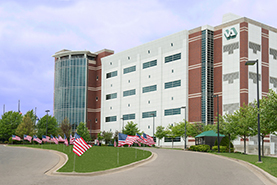 Our VA Urologists have dual appointments at the University of Michigan as well as the VA. As such, the VA Urology Program offers the entire spectrum of state-of-the-art specialty care, including advanced open and minimally-invasive/robotic surgical techniques. Our high-volume outpatient and procedure clinics provide ambulatory Urology services to our Veterans from across our region. VA Urology physicians are also involved in innovative urological research and can provide referrals to numerous on-site specialty clinics staffed by U-M faculty physicians. For more information about the Ann Arbor VA Urology Program or the VA Hospital, visit the official Ann Arbor VA Healthcare System Website or its subsections for Primary Care and Specialty Care.